This compact, powerful laser rangefinder is universally suited for all military services and tactical units. 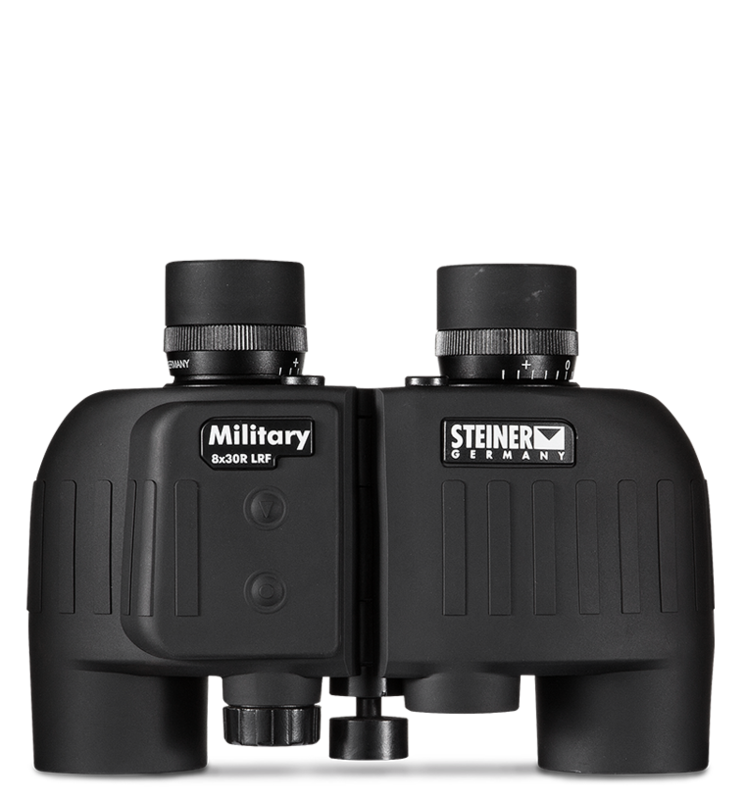 It’s the perfect combination of premium Steiner binoculars with a powerful class 1/eye safe laser for determining range to targets, plus a SUMR reticle for targeting redundancy in case of battery failure or out-of-range target. No other bino/rangefinder combo will deliver the image and ranging accuracy and reliability of these military veterans. Perfect for mobile troops who travel light. Lenses and prisms are combined with state-of-the-art coatings to provide bright, crisp images at any range. Ranges can be set to meters or yards. This item is ITAR controlled. shifts the center of gravity into the palms for comfortable, long-time observation and round-the-shoulder shape won't hang up on hatches and doors in urgent situations. lets you focus each eyepiece to your vision once, then keeps images razor sharp from 20 yards to infinity. No more chasing focus on moving objects. is durable, slip-proof and noiseless to ensure secure, chassis-protecting grip in all conditions. M830r LRF 8x30, Laser Rangefinder is rated 4.3 out of 5 by 3. Rated 5 out of 5 by Tarponchaser from Awesome range finders I used these at the Sniper's Hide Cup in 2015. We had a lot of fog one morning and I was shooting the stage from 1150 to 1350 yards. My Terrapin would not range the targets, but my Steiner 8X30 LRF did. Hello. Does this product come with the &quot;Tripod &amp; Picatinny Mount&quot; ? If it doesn't, how can I order it separately? I need to give our Distributor the part number. Thank you. The LRF binoculars have a threaded hole for a 1/4&quot; tripod stud on the objective end of the hinge. There is no Picatinny mount. Which models of your laser rangefinding binoculars are or will be bluetooth compatible with the bluetooth accessory? what is the eye relief on this product? Good Morning, do you have nitrogen injection kit for a M830r LRF 8x30 Binoculars Laser Range Finder? We do not make a nitrogen injection kit for our binoculars. If you suspect your binoculars have a bad seal or are otherwise compromised, please submit a case through our support portal at https://steiner.supportsync.com/. I understand the m830r has a inclinometer (right?). Q1: Does it display the Angle Modified Range as well as the true (direct line) range? Q2: What can we expect with ranging on non-reflective surfaces? Q3: What is the beam divergence and frequency? The red LRF circle may appear off center from the range finding reticle. Do any of your binoculars have LRF, mil range reticle, and compass? We do not have one that has all three. could you explain the difference between fully multi-coated optics and high definition optics?